It is apple picking time in the Finger Lakes! One great spot to spend a Saturday afternoon is Owen Orchards on Route 5 between Auburn and Elbridge. Whenever we drive by, my daughter and I must pick up a bag of apple cider doughnuts. We like the cinnamon and sugar variety best. And are they a tasty treat when still warm. Add a side cup of either cold or hot cider for the prefect autumn snack. The barn shop is full of all sorts of things to check out. There is a collection of antique apple peelers and corers along with food items. You will find hot sauces, jams, jellies, preserves, apple butter, old fashioned candies, preserves, Maple syrup, New Hope pancake mixes; pickles and relishes, Coghan bologna, River Rat cheese from The 1,000 Islands, Wake Robin Cheese curds plus free range eggs, assorted vegetables and, as the season moves along, a huge selection of all sizes and varieties of pumpkins and squash. You might even bake up a pan of New Hope Mills Apple Crisp Mix with apples you picked yourself. 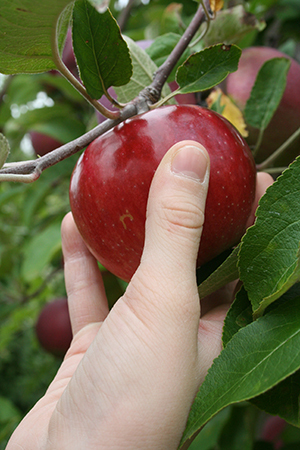 You and a crowd of friends can enjoy a wagon ride out into the orchards and select from 18 varieties of apples. The price is 75 cents per pound – now that is a real deal! The wagon rides are available any weekend - Saturdays and Sundays – from 9am to dark. There are cook books with recipes your grandmother might have made. The delicious cider is not pasteurized and has no preservatives which means you can pick up a Hard Cider Kit to use at home and make your own tasty treat. Want an unpretentious and tasty autumn dessert or side dish which is a real throw back. How about apple sauce? Now some people like smooth apple sauce, but my family favor chunky style. So simple and quick. I like to use a variety of apple varieties – 2 or 3 for flavor and texture. You can either peel or not peel the apples. Core and slice into small pieces. Place in a pot with about a ¼ of water. Add some cinnamon, nutmeg, ginger and sugar – all to your taste. And that pinch of salt. Cook on low for 15 minutes checking and stirring occasionally. Mush with a potato masher or fork to the lumpiness you like. Serve warm with a pork roast or as a humble dessert with a scoop of vanilla ice cream. 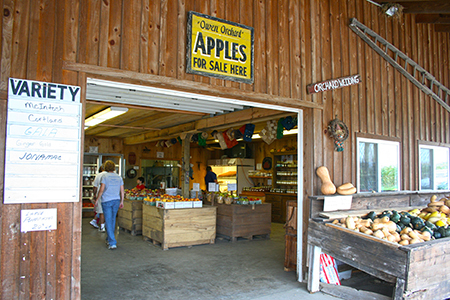 Owen Orchards is also a participating member of The Finger Lakes Sweet Treat Trail. You can pick up your tasting Tour pass, get it stamp and, if you visit 10 or more Sweet Treat Trail stops before November 15, you could win a basket of local sweet treats. Don’t miss out.